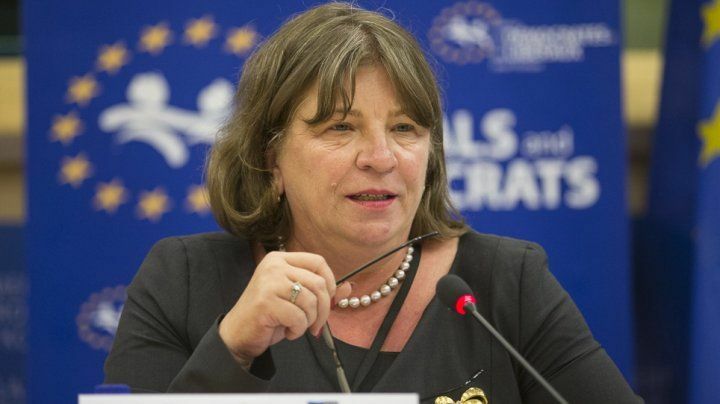 Norica Nicolai is the vice chair of the European Parliament’s liberal ALDE group. A lawyer by formation, she has served as parliamentarian and as a public prosecutor in her native Romania. Let’s start with the developments in Romania. What’s the news from Bucharest? Now the parliament is involved in amending the legislation in justice. We already adopted three pieces of legislation related to the reorganisation of justice. We started changing the criminal code and penal procedure, which is necessary because, according to our constitution, when the constitutional court declares a text of law unconstitutional, we are obliged in 45 days to manage to change it. … in the foreign area, the big question is: Is Romania going to move its embassy to Jerusalem? Yes, this is the big question. We start to analyse this. Our colleagues from the SPD, we are in coalition now in the government [the cabinet of PM Viorica Dăncilă is a coalition of PSD and ALDE], they strongly believe that it is necessary to follow the US in this decision, which is a very controversial, sensitive decision. For us, the relation with the US was a privilege in our history. For the moment, it’s a decision in debate. I don’t know what will happen, next year maybe. The other issue, which is not so important for us but it is important for Europe, is Trump’s decision to pull out of the Iran deal. This decision will be, I believe, the most important political decision that can attract some unpleasant political and economic reactions. In any case, Romania remains friendly to the US? Yes, it remains friendly. Personally, I consider it is not a good decision for the EU. Trump manages the US like a businessman, he needs profit for the US, he doesn’t have a political or international programme. You are probably a bit of a dissident when you say this, compared to your coalition partners. Yes, because I believe that this decision marks the start of an economic war between the EU and the US. Eastern Europe is less concerned, but this is very serious for Germany, a member state which is present in the world economy, in China, in Central Asia, in the Caucasus, and the US want to recuperate this supremacy of the German economy. In this context, the Germans become more and more vulnerable. In terms of economy, with the sanctions, they could lose almost €4 billion, which is the German investment in Iran. Trade between the EU and Iran is almost €25 billion. With sanctions, the European economy could lose a lot and this can attract problems inside the EU. The strongest country, which is considered to be Germany, would become not so strong. How about the European policy in its neighbourhood? Maybe now the EU is too busy to deal with the US, with Russia and cannot really focus on Eastern partnership countries and countries in Central Asia. You were recently in Azerbaijan, what is their perspective on this? I was really happy that Azerbaijan decided to increase their level of relations with the EU because it is good for both of us. For us especially, because there are a lot of European companies who do business in Azerbaijan. I believe that we need to support the Eastern Partnership at this moment, we need to look at what unites us, not the things that make us different. The EU sometimes forgets about diversity, which is one of its main principles. You say the European Parliament is more open to Azerbaijan? I believe it’s more open. The parliament does not put benchmarks like usual, sometimes they are arrogant because they don’t understand the reality. Yes, there was a crisis, they left from Euronest for one year, they came back but this was because we pushed them to come back, a few members of parliament and the Commission pushed Azerbaijan to come back. Otherwise, if we don’t have Azerbaijan, Georgia, Ukraine, Moldova in the Eastern Partnership, we risk a failure in our neighbourhood policy. We have a failure in the Southern area in our neighbourhood policy because the Mediterranean association is a failure, we do almost nothing there in terms of foreign policy, we are not relevant, we lose a lot. If we are not close to our Eastern partners, we risk being isolated in a world that is more and more open and global. Yes, it was a kind of a Vivaldi approach because people in Brussels forget about the four seasons. They consider that all the life is spring, it’s not like this. Today we have the winter, with the migration, the insecure situation, there is still war in Syria. It’s a huge attitude problem. It’s not normal for us to react in such an arrogant way. This is the kind of arrogance which is done by the welfare. It means that you are not able to look outside with clear eyes. But you are Romanian; I think Romanians can have a better understanding. Yes, our former communist background allows us to be more open to the others and to understand the diversity. It’s difficult to impose a model in terms of politics because each society has history, traditions, culture, and different people. This type of uniformity doesn’t work in a global world. You are too small to do this, I mean the EU is too small to do this. How do you see the future relations between Azerbaijan and Armenia? In Azerbaijan, I know the leadership is more open to finding a political solution. But the main problem in the area still remains Russia. Russians were clever enough to secure their influence of the former Soviet Republics and their created frozen conflicts in Transnistria, Abkhazia and South Ossetia and in Nagorno-Karabakh. In this house [the European Parliament] there are a lot of people who support Armenia and considered [Serzh Sargsyan’s] a democratic regime, although it was a regime managed by Russia, because they are still present. The new change in Yerevan can open the dialogue, because Russia at the moment is too busy with other dossiers, and I hope that in the next four, five years, if Armenia remains politically stable, we can achieve something. Is there a Russian lobby in the European parliament? Is Azerbaijan unfairly targeted by the Armenian lobby? Yes, Armenian lobbies have a big influence. I remember that when I went to organise a meeting with people coming from Nagorno-Karabakh, internally displaced persons, they could not obtain visas from the French embassy in Baku to come to this house and give testimony about what happened after they had to leave Nagorno-Karabakh. I consider this as something done by an Armenian lobby. Unfortunately, many European countries react according to this lobby, they don’t want to see what’s happened in the area. Right now, Azerbaijan is not in a very good situation: it is between Turkey and Russia. It’s a new republic and we need to support it, according to the people’s will. Still, we can say that there are human rights problems. Yes, there are problems with human rights all the time. But they are starting to manage. There are a lot of NGOs and people who are able to protest. This is normal. The situation can change, step by step, but it takes time.